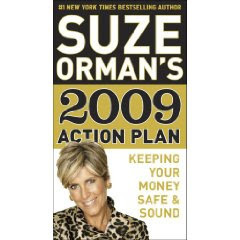 On the Free Give Away offer by Oprah Winfrey, you can download a latest book by Suze Orman - 2009 Action Plan until Thursday, January 15. The book is also available in Spanish. This book is available at around $10.00 in the market. But here is your chance to get it free. Grab it before the offer expires. If you do not know who Suze Orman is: She is the host of The Suze Orman Show on CNBC. She has written six consecutive New York Times Best Sellers; has written, co-produced, and hosted six PBS specials based on her books; and is the most successful fundraiser in the history of public television. Talking about the book, this book will help you navigate the new financial obstacles you may be facing in 2009. As reviewed by the readers, "The book has situations and actions--for example, Situation: your daughter is getting married and you thought you'd have a huge wedding for her. Action: how to realistically plan a wedding that doesn't sink you immediately and in the future. Read More Reviews & Details About the Book 2009 Action Plan at Amazon.